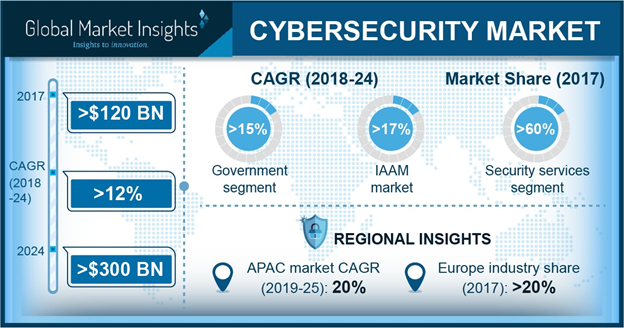 Cyber Security Market size is set to exceed USD 300 billion by 2024; according to a new research report by Global Market Insights, Inc. The rising penetration of various mobile & wireless devices is fostering the growth of the cyber security market. The falling prices of mobile devices and advancements in the connectivity infrastructure across the globe are propelling the adoption of smart devices across enterprises and consumers. This has caused a simultaneous increase in the number of cyber-attacks on mobile devices. In 2017, cyberattacks on mobile devices increased by over 40% with an average of over 1.2 million attacks per month. Hence, end-users and organizations are embracing cyber security solutions leading to the growth of the market. The IAAM segment will grow at a CAGR of over 17% over the forecast timespan. The increasing spending by large enterprises and government organizations is driving the growth of the cyber security market. Additionally, the emergence of stringent regulatory compliances due to security concerns is expected to increase, impacting positively on market growth. The infrastructure protection market is also expected to grow at a significant pace over the projected frame due to the growing adoption of IoT devices and the increasing use of email & web-based applications. In 2017, the large enterprises market accounted for a market share of over 60% in the global cyber security market. The increasing risk of cyber-attacks is driving the adoption of cyber security solutions among large enterprises. In 2017, the large organizations lost an average of over USD 10 million due to cyber security breaches. The average cost of cyber-attacks rose by 11% in 2017. This has encouraged large enterprises to adopt security solutions to mitigate the risk of cyber-attacks. The SME market is anticipated to witness a high growth rate due to the extensive adoption of BYOD policies to improve employee productivity. The transportation cyber security market is expected to grow at a CAGR of over USD 15% over the projected timespan. The use of smart logistics, IIoT, and other reconstruction initiatives have further increased the risk by creating a wider attack surface from enormous systems. Any disruption in the operations of transportation and logistics companies can cause substantial downtime and loss of revenue. This is leading transportation companies to implement cyber security solutions. The IT & telecom sector is also predicted to grow at a high pace as it deals with sensitive customer data used for providing unified communication services. In 2017, Europe accounted for a share of over 20% in the global cyber security market. The regional market is expected to grow exponentially due to a rise in the number of government investments and public-private partnerships to enhance the cyber security infrastructure. In addition, there is an introduction of supportive government policies and compliance regulations mandating companies to adopt security measures. The Asia Pacific cyber security market is predicted to grow at a CAGR of 20% over the forecast timespan. Extensive digitalization across multiple industry verticals and the rising number of smartphone users are factors driving the growth of the market in the region. Prominent companies operating in the cyber security market include BAE Systems, Cisco Systems, Inc, CyberArk Software Ltd., McAfee LLC, Microsoft Corporation, IBM Corporation, Intel Corporation, Proofpoint Inc. Rapid7, Sophos Group plc, Splunk, Inc, Symantec Corporation and Trend Micro, Inc. RSA Security, LLC., Oracle Corporation, Palo Alto Networks, Inc., FireEye, Inc., Fortinet, Inc., Hewlett-Packard, Ltd., F-Secure Corporation, F5networks, Inc., Check Point Software, etc. Players in the cyber security market are strategically acquiring various cyber security providers to strengthen their product portfolio and increase profitability. For instance, in November 2018, Symantec Corporation acquired Appthority, a cyber security start-up offering mobile threat detection solutions to integrate its SEP mobile capabilities into Symantec’s mobile endpoint security solutions.